Deemed a powerful protective stone, the labradorite meaning is associated with higher spiritual plains, intuition and imagination. The lore and legend surrounding this mystic stone place it at the center of the magic realm. Thought to have been created in the celestial fires of the Aurora Borealis, labrodorite or spectrolite is held in high regards for its connection to shamans, diviners or crystal healers. This spectacular gemstone was first discovered in Labrador, Canada in 1770. Nonetheless, references to the stone of magic were transmitted from old Inuit tribes. Labradorite is a feldspar variety shimmering with mesmerizing hues of blue, gold, green and red. 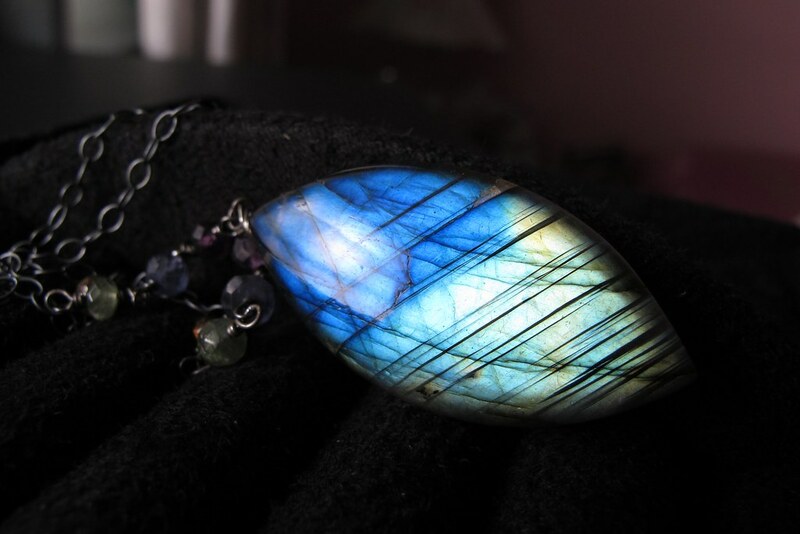 Much like the majestic tail of a peacock, labradorite reveals its iridescent flashes even in the faintest of lights. While the copper red or golden hues are fascinating, it’s the light blue to deep blue shades that enchant the onlooker and make this gemstone so irresistible. The meaning of labradorite has been carved through centuries of observations on the properties of this gemstone. This variety of feldspar is deemed a powerful gemstone of transformation, imagination, and illumination. The gemstone is associated primarily with the Crown Chakra. From this standpoint, the labradorite stone meaning is entwined with openness, clearing the mind and insightfulness. A crystal of intuition and spiritual development, labradorite harbors highly positive energies that reduce anxiety, negative emotions and feelings and boost self-awareness. Labradorite meaning is closely connected with the gemstone’s ability to clean, balance and protect the aura. As it vibrates with the Crown Chakra, labradorite is used in crystal healing therapies as a generally protective crystal, but also to support enhanced brain health. The labradorite crystal meaning has also been inherited from the legends surrounding this beautiful gem. Shimmering in mystical lights, labradorite is said to ease and transform the connections between unseen realms and the seen world. It opens the door for enhanced intuition and guides the way to self-discovery while awakening a person’s psychic abilities. Unearthed in 1770 by Moravian missionaries in Labrador, Canada, labradorite was soon after classified as the gemstone we know today. It a variety of the Feldspar family with a hardness of 6 to 6.5 on the Mohs Hardness Scale. Its distinguishing properties are rendered by the remarkable colors bundled in one gemstone. The shimmering and play of color of labradorite is known to gemologists as labradorescence. Labradorite’s radiance varies from gray-green to black and dark blue as well as light blue, red, gold and even pale green. The gemstone is still mined in Canada. Other mining resources are scattered around the globe, including the United States. The majestic labradorite came to fame in Europe during the 18th and 19th centuries when nobility and royalty adorned their jewels and clothing with this gemstone. We have mentioned that the labradorite gemstone meaning is closely associated with its healing properties. A stone of transformation, the healing crystal will guide one through change, instilling strength and perseverance. As a gemstone that vibrates with the Crown Chakra, labradorite relieves stress and anxiety and balances the energies flowing through our body. The labradorite spiritual meaning stands for change. The gemstone is used to assist the process of transformation by dispelling illusions, revealing the truth and grounding a sense of self-assurance and enhanced intuitive powers. It is an ideal crystal to ground energies and raise consciousness. Thus, a labradorite crystal is a useful companion when we need to regain and strengthen faith in ourselves. Anxiety often clouds the mind. Nevertheless, wearing labradorite jewelry helps to lift anxious thoughts, calm the mind and instill a sense of creativity and novelty. Labradorite is known as a crystal of joy and spontaneity. Daily routine and responsibility may become overwhelming at times. Dealing with this feeling sparks an energy drainage that leaves us tired and stressed. Labradorite is the ideal antidote as it blocks energy drainage and channels the energies into the ideal balance. Many consider labradorite to be the patron of the subconscious. As such, labradorite aids with bringing forgotten memories back to the surface while facilitating understanding. The uplifting crystal encourages introspection and contemplation, setting the scene for an intuitive understanding of a past problem. Labradorite dispels insecurity and fear, making room for faith in the future and in oneself. While it is primarily associated with the Crown Chakra, a second association of labradorite is with the Throat Chakra. The throat chakra is deemed the energy stimulator for other chakras. When it is blocked, one may find difficulties in expressing feelings and emotions. Labradorite balances and unblocks the throat chakra so that we can easily communicate our beliefs, ideas, feelings and emotions. When the chakras are in balance, the energy can easily flow through the body. The dark blue radiance of labradorite is associated with truthfulness. The light blue hues encourage relaxation and a grounded balance. With its mesmerizing blend of colors, labradorite is a healing crystal that resonates with all the chakras, helping us to balance and ground ourselves. Labradorite is used in crystal healing therapies to assist with the healing of brain or eye disorders. As the healing gemstone vibrates with the crown chakra, it is deemed a patron of the neural system. Against this background, it’s a powerful stimulant for mental acuity. A stone of balance, labradorite aids with balancing hormones and regulating the metabolism. At the same time, the crystal is used in healing therapies for gout, rheumatism, high blood pressure or faulty digestion. It is a stimulant and supportive stone for the immune system, effectively healing colds. Health problems related to the lungs or respiratory problems also fall in the array of labradorite. Due to the abundance of colors found in labradorite, this gemstone is one of the most powerful protective and supportive crystals. There are plenty choices of exquisite labradorite jewelry items out there, so find the one that vibrates with you the most and let the energy of this gemstone guide your steps. Hey Buddy!, I found this information for you: "Insights on Labradorite Meaning, Properties and Healing Energy". Here is the website link: https://accessgems.com/labradorite-meaning/. Thank you.